I’m back! And I’m getting a little stressed about the clock. I hope to be able to finish this up tomorrow so I have time to get a couple coats of varnish in before I give it to him. It took me a while to figure out how I would go about the grass, but I think I got something here. 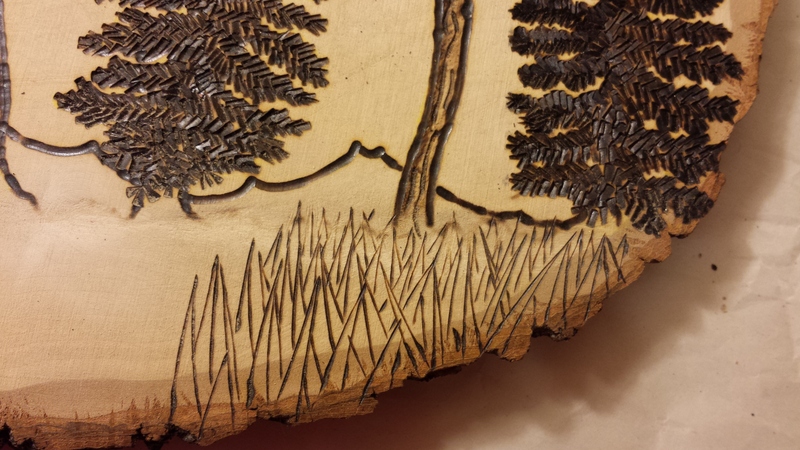 I took some sand paper and did the best I could to erase the thick black line I burned to define the grass line. And instead I’m incorporating blades of grass. To create dimension, make the blades bigger in the front of the picture (Or at the bottom of the frame), and smaller as they get further away (or toward the horizon line). This will give the illusion of depth.